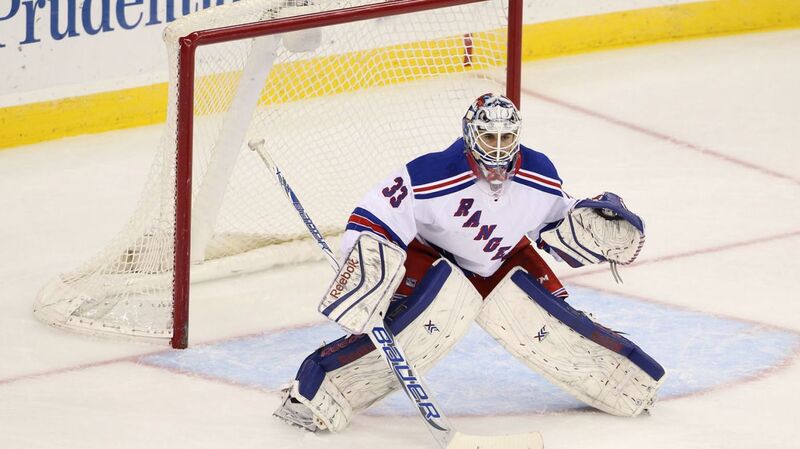 Cam Talbot is the number one target for both the Buffalo Sabres and the Edmonton Oilers. Will he be able to bring a first round pick in return? Photo courtesy of Getty Images. It was a busy day in the NHL today, with the league agreeing on a new salary cap, and trade rumors surrounding Cam Talbot coming to a head, with an actual offer being made to the Rangers. This afternoon, Darren Dreger reported that a team (not specified) offered Glen Sather two second round picks for Cam Talbot, which he turned down. Sather realizes that Talbot is the most coveted goalie on the market, and wants to maximize his return. Peter Chiarelli, the new GM of the Edmonton Oilers, would disagree. This afternoon, he said that the market for goaltenders is actually a buyer’s market. Personally, I think that Chiarelli is trying to downplay the interest he has in Talbot. For a long time, Edmonton has been the rumored destination for Talbot, and that’s still the case. The Oilers and the Sabres are the teams that are most interested in acquiring the 27 year old netminder’s services, with Ottawa’s Robin Lehner next. With that in mind, why would either team want to settle? If the Oilers are deadest on having Talbot as their number one, why would Chiarelli be hesitant to pull the trigger on a trade and risk losing him to Buffalo? The Oilers seem hesistant to give up the 16th overall pick, and would be much more comfortable trading away the 33rd overall pick. However, there’s one thing standing in the way of the Oilers plans to keep both first round picks. The Buffalo Sabres have two draft picks in between the Oilers’ two picks – number 21 and 31. If the Oilers won’t give up the 16th pick, then the Sabres could swoop in and offer a higher draft pick, and steal Talbot right from the grasp of Chiarelli. Sure, there are more goalies than there are teams looking for one. But when your goalie is at the top of the list, you can demand more, which is exactly what Sather is doing. Edmonton has plenty of draft picks and prospects to offer, but so does Buffalo, and the Rangers could get just as good of a return from their in-state neighbors. Sather is right to patiently wait and get the right return. There is a really good chance that he could wind up getting a first round pick for Cam, and if there isn’t a good package available, then there is no harm in keeping him as a backup for a year. Whichever way you look at it, the Rangers have the upper-hand in the Talbot negotiation. This afternoon, the league agreed on the new salary cap, with a new salary floor and ceiling set for the 2015-16 season. The lower limit will be $52.8 million, with the new max salary for a team set at $71.4 million, $400k higher than originally anticipated. That $400,000 is actually a lot more important than it seems, as it could be just enough to re-sign a free agent, and it could be the difference when trying to fit someone into the roster through a trade. Sean Hartnett said it best when describing how important the extra money could mean. That $0.4 million could make a big difference. Last summer, Mike Santorelli chose TOR over NYR because TOR had an extra $0.5M to spare. During the end-of-season meeting, which started today, the GMs will not only be discussing trades, but a potential change to the overtime format as well. The GMs want to institute 3-on-3 play, either at the start of overtime, or after a few minutes of 4-on-4 play, a format currently used in the AHL. There is no movement to completely eliminate the shootout, but instead to make it less frequent and keep it special. The NHL Awards will take place tomorrow in Las Vegas, and the NHL Draft will take place this Friday and Saturday. Posted on June 23, 2015, in Rangers Updates, Uncategorized and tagged 2015 NHL Draft, Buffalo Sabres, Cam Talbot trade, Edmonton Oilers, Glen Sather, Madison Square Garden, MSG, New York Rangers, NHL Draft, NHL salary cap, NHL Trade Rumors, NY Rangers, NYR, Peter Chiarelli, Rangers, Talbot trade rumors. Bookmark the permalink. 1 Comment. I wouldn’t be surprised if Sather is looking for more than just picks for Talbot. Sather is not getting any younger and wants to win NOW. We also know that we could use a shooter, or at least a bigger body that knows how to find the back of the net. Maybe that is what he hopes to get in return for either Hags or KK (or both?). Or maybe he is trying to create a large package deal that involves a little bit of everything. Unless…unless he decides to make a few trades…all for picks. That would leave us with the UFA market. If Sather trades away a few guys for picks, look for him to make a run @ Soderberg, or someone like Fehr (if the Caps don’t resign him), or even Shawn Matthias.